There are any number of issues that can cause your air conditioner to stop working. Luckily, they’re not all expensive fixes. The problem could be just a loose wire that’s caused a power failure in your air conditioner. Or you could have a clogged air filter that’s impeding the air flow to the system. On the other hand, when AC compressor failure causes your system to breakdown, you have a major AC emergency service problem and a big expense on your hands. The compressor is a vital and expensive component, and when it goes you may find yourself dropping a lot of cash on a new AC unit. The good news is, as much as 80 percent of the causes of AC compressor failure are preventable if the problems leading to the failure are corrected in a timely manner. These problems can be detected and eliminated during regular AC preventative maintenance. Related Article: 8 Ways AC Preventative Maintenance Keeps the Repairman Away. It’s one of the key components without which the system can’t function. It’s usually very reliable, and if it’s failed before its expected life span (10 to 15 years), it’s probably due to an underlying cause that’s often preventable. It does fail, it’s expensive and sometimes impossible to fix it. Like your heart pumps blood through your body, the compressor’s job is to compress the refrigerant gas (hence the name) and pump it through the system so that it can remove heat and humidity from the air. Now that you understand why it’s so critical to keep your compressor in good shape, let’s take a look at some of the things that can cause AC compressor failure and what you can do to avoid them. If you replace a failed compressor without fixing the underlying cause, the new compressor is likely to fail as well. When dust, grime and mineral scales build up on the condenser coil, the air conditioner can’t expel enough heat from the system and it’s forced to run constantly trying to cool your space. The increased pressure and temperature can cause the compressor to overheat and fail. When your air conditioner’s refrigerant lines become blocked or damaged, the first thing you’ll notice is that the unit is not cooling as effectively. If the problem is not fixed, once again the increased pressure and temperature cause overheating and AC compressor failure. If your system’s refrigerant lines develop holes or cracks, the air conditioner leaks refrigerant. After a while, the level becomes so low that the compressor has to work harder to pump enough refrigerant through the system to cool your space. The strain can eventually cause the compressor to break down. 4. Incorrect suction line size. If your refrigerant line develops leaks and needs to be replaced, make sure you get an experienced AC technician to do the job. A line that’s too large or too small for your system can cause premature AC compressor failure. If a less-than-qualified person works on your air conditioner and inadvertently adds too much refrigerant, or even the wrong type of refrigerant, it can be a deadly mistake for the compressor. An electrical failure can result in a buildup of acids that cause a great deal of damage to other parts in addition to the compressor. If you have a failed compressor, make sure the technician tests for the presence of these acids. If he finds them, an electrical burnout has caused damage throughout the system that is probably not worth fixing. But electrical problems are often easily preventable when an experienced tech inspects your system: he can spot and repair damaged wiring, fuses and contractors before they take down your system and cause AC compressor failure. Related Article: A Guide to the Top 3 Power Related Air Conditioner Problems. 7. Contaminants in the system. The high heat and pressure in an air conditioning system, not to mention the locations where they are typically housed in New York City (outdoors, on rooftops, in crawl spaces) can introduce any number of contaminants that can cause damage. These include air, moisture, dirt, debris, leaves, soot, acids, and even bird and pest droppings. Related Article: What You Don’t Know Can Hurt You: How To Keep Your HVAC System Contaminant Free. To take the heart comparison a step further, think of your air conditioner’s oil lubricant like the blood in your body. If there’s not enough, the system can’t work properly and all kinds of problems can result, including AC compressor failure. When your system is regularly maintained by a trained AC professional, he will check the lubricant levels and the condition of the oil pump to prevent this problem. When you take good care of your compressor, it will take good care of the air in your space with consistent, reliable cooling. That means having your air conditioning system serviced at least twice a year by a reputable AC service company. Make sure you choose a service provider with knowledgeable, experienced technicians with MSCA or NATE certification. That way you’ll know that they have the expertise to spot and prevent the problems that can cause AC compressor failure. Did you know that you’ll get the best deal on AC preventative maintenance when you invest in a yearly service contract? You’ll also get a maintenance plan that’s designed specifically for your needs and your budget. Want to learn more? 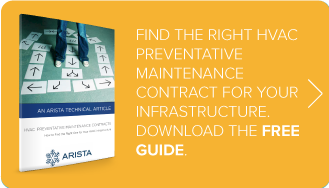 Take a look at our free guide, HVAC Preventative Maintenance Contracts: How to Find the Right One for Your HVAC Infrastructure.